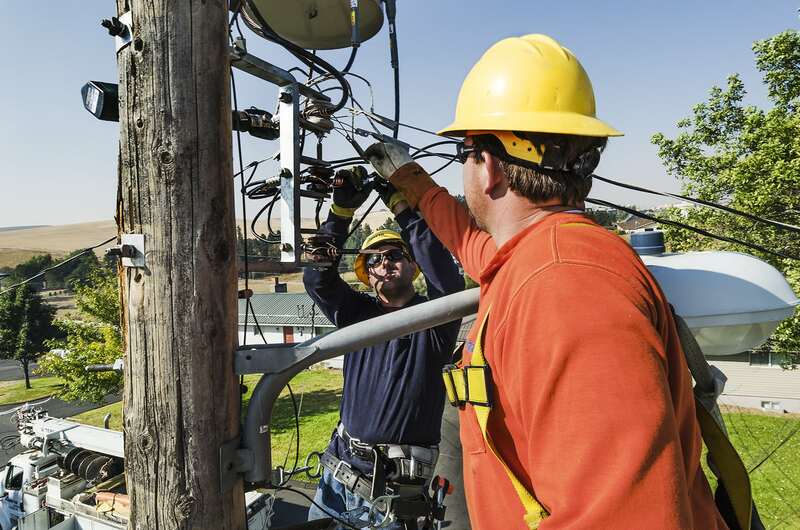 Utility Avista installed smart transformers to improve distribution system efficiency in Pullman, WA. Photo by Avista. Idaho Falls Power tested requirements for connecting plug-in hybrid electric vehicles. 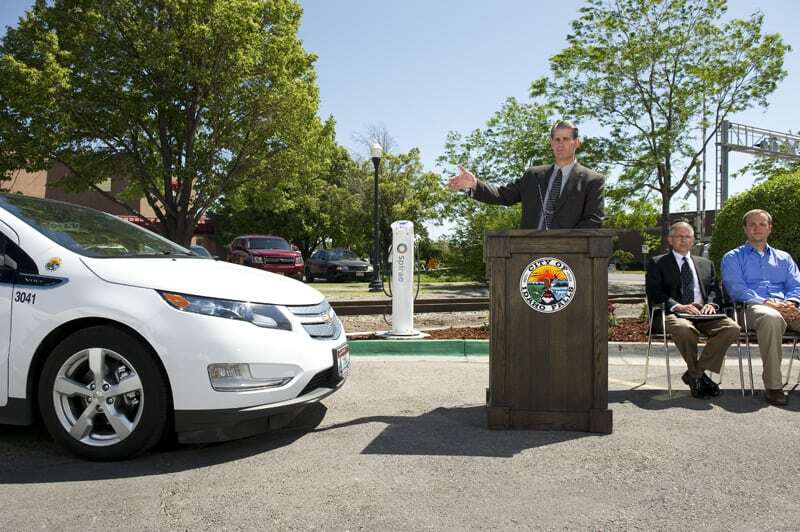 Here, Mayor Jared Fuhriman unveils a new fleet of five Chevy Volts. Photo by Pacific Northwest National Laboratory via Flickr. 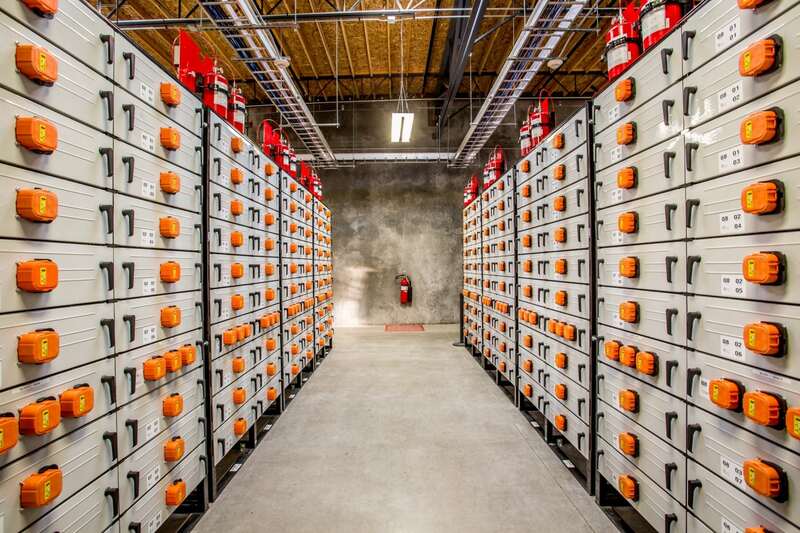 Portland General Electric installed a 5-megawatt lithium-ion battery at its Salem Smart Power Center, part of the Pacific Northwest Smart Grid Demonstration Project. Photo by Portland General Electric via Flickr. 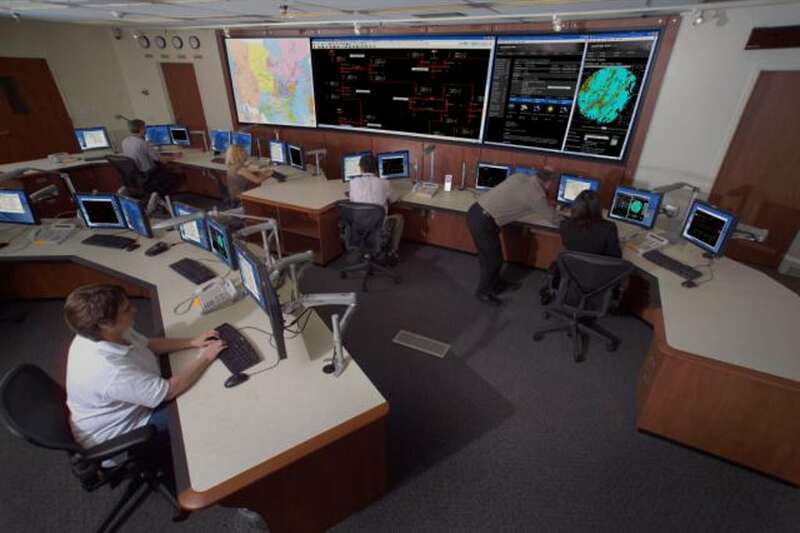 The transactive control signal at the heart of the Pacific Northwest Smart Grid Demonstration project is issued from a control room in Richland, WA. Photo by Pacific Northwest National Laboratory via Flickr. The largest smart grid demonstration project in the U.S., covering about a dozen utilities in five Northwest states, has shown how adding more information at all levels of the electricity system can improve efficiency and potentially lower costs. 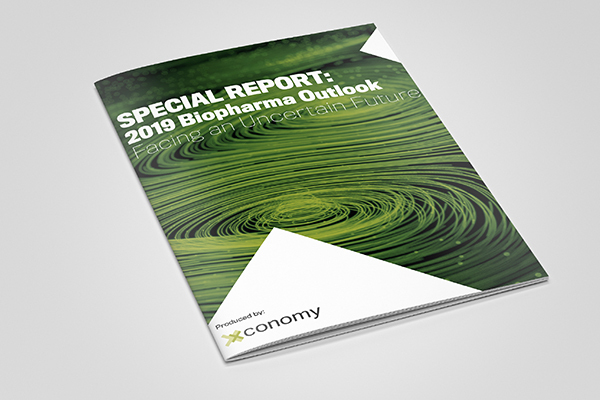 But the project, which wrapped up data collection last summer and is now sharing results, also highlighted the challenge many industries face as they embrace the Internet of Things, deploying more sensors and connected devices that unleash a torrent of data: Ensuring that data is reliable is difficult. Drawing meaningful insights from it can be harder still. The Pacific Northwest Smart Grid Demonstration Project, a five-year, $178 million effort funded by the federal government, utilities, and participating technology companies, included a host of component pieces from modern electricity meters to controllable thermostats to smart transformers. Perhaps most importantly, researchers designed and deployed a new signaling technology meant to allow these and other devices to rapidly respond to the needs of the broader electricity system. This “transactive control” signal could help form a new market to incentivize new, more flexible technologies—potentially installed in individual customers’ homes and businesses—that would allow the electricity system to accommodate more renewable energy. At its essence, a smart grid provides more information to all electricity producers, distributors, and consumers, allowing better decisions and improved automated operations—all with the goal of reducing costs and improving efficiency. “That’s our hope and the promise of the technologies,” said project director Ron Melton, on staff at the Batelle-operated Pacific Northwest National Laboratory, which headed the project along with the Bonneville Power Administration. But producing and delivering high-quality, reliable information can be challenging. “One of the things we’ve learned on the project is that it is not easy to operate some of these technologies and some of this equipment in a way that produces good quality data all of the time,” he said, noting that this is not unique to the Pacific Northwest project. Smart grid builders and operators face some of the same problems cropping up in many other industries, as new sensors and devices proliferate, each one throwing off streams of data that can pile up faster than they can be used. “The ability to effectively apply the data just from that point of view is a challenge in and of itself,” Melton said. Utilities and their customers installed some $80 million in smart grid equipment as part of the demonstration project. Spokane, WA-based investor owned utility Avista, for example, upgraded several aspects of the electricity distribution system in Pullman, WA, giving the utility instant alerts when problems occur, improving efficiency by using appropriately sized transformers, and installing thermostats the utility can remotely adjust (with customers’ consent). Before the project, the University of Washington had only seven electricity meters monitoring flow into its main Seattle campus, which includes some 250 buildings and 14 million square feet of space. It now has about 200 meters that allow a much finer-grained view of where and how electricity is used. That, in turn, enables improved energy cost management and efficiency improvements, Melton said. Portland General Electric, another investor-owned utility, built a Smart Power Center in Salem, including a 5-megawatt lithium-ion battery, connections to a local solar project, and new controls technologies to establish a micro-grid. Customers nearby can voluntarily reduce electricity usage to avoid times of peak power demand. Of course, not every technology worked perfectly, and some things tried across the demonstration project’s 13 sites had to be taken out of commission, Melton said. But that’s part of the reason for demonstration projects like this one. “Many of the utilities have learned a lot and are now able to progress in terms of making investments in additional equipment and technology with knowledge in hand,” Melton said. Other improvements have been made behind the scenes, he said. With the growing threat of cyber attacks on infrastructure such as the electricity grid, the project focused on security and interoperability. The project documented current best practices and encouraged utilities to adopt them. Melton said the larger utilities were already well on their way, but some of the smaller ones were confronting new security threats along with new technology, such as smart meters, which connect their customers’ sites directly to utility back-office systems. “We upped the game for many of the participants and improved their cyber-security awareness and capabilities,” he said. At the heart of the project was a set of two-way signals meant to communicate the expected balance of supply and demand on the electricity grid in the immediate future, allowing utilities and other players to respond accordingly. One of these is an incentive signal designed to indicate the price of delivering power to a certain location at a certain time.